Now if you’re expecting a traditional spaghetti vongole then think again! Vongole is a classic Venetian clam pasta dish but this is a twist on it. 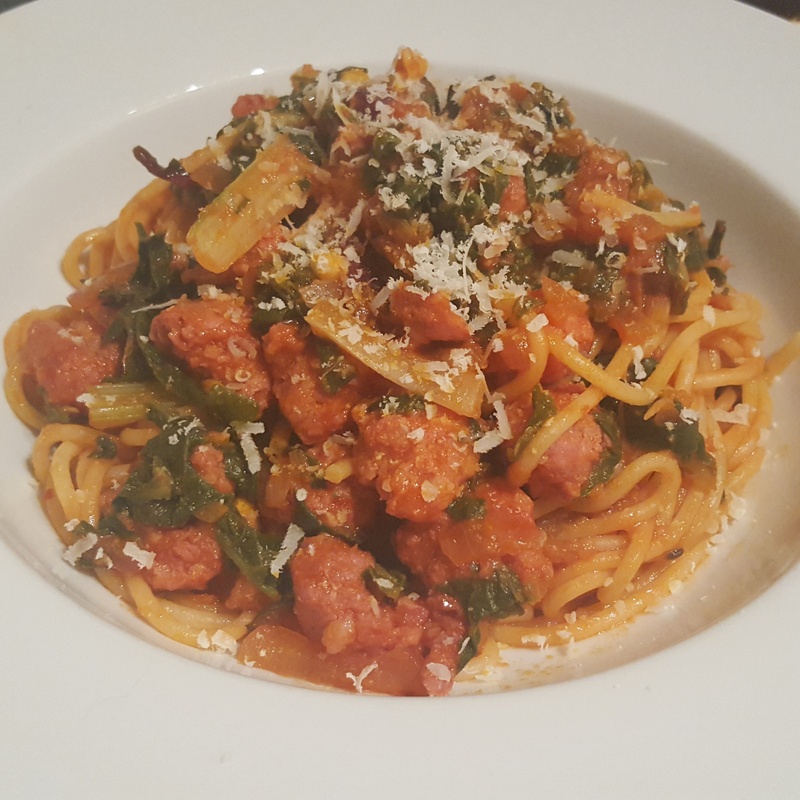 I have used a touch of nduja which is a Calabrian spreadable salami to add a chilli hit along with some vine cherry tomatoes which give the pasta a wonderfully light, summery feel to it. It is also a perfect way to try clams in pasta if you haven’t had them before. 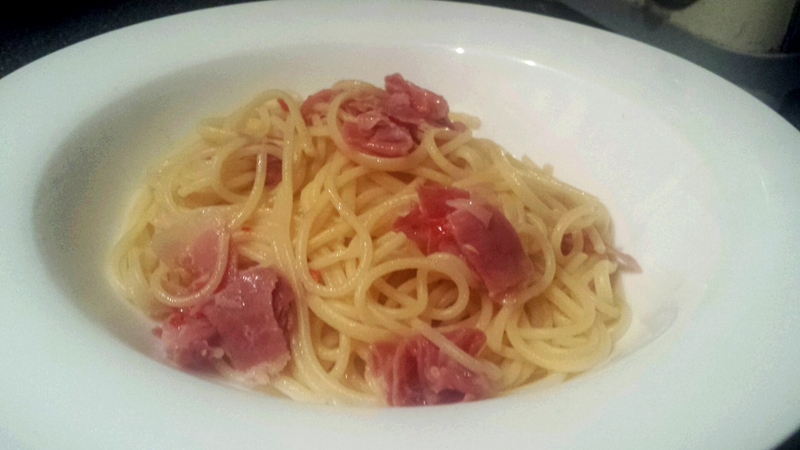 I also used linguine instead of spaghetti for a change and the sauce clings perfectly to it. Clams can be bought fresh or you can also get them jarred in good Italian delicatessens. I was recently bought a jar so used this and I was pleasantly surprised! They needed very little preparation apart from a quick drain and I then removed any that were already open and any pieces of broken shell and away I went! 1. Bring a large pan of water to the boil for the pasta and cook according to packet instructions. The pasta will be finished off in the sauce so aim for al dente; drain and set aside whilst you crack on with the sauce. 2. Take a wide pan and heat the oil over a medium heat. Add the garlic cloves and cook for a couple of minutes until starting to soften. Stir in the nduja so it starts to break and melt into the oil before pouring in the wine. Simmer until reduced by half. Take the cherry tomatoes and quarter them. Add the tomatoes in and simmer until the tomatoes start to reduce and thicken. Taste and adjust the seasoning if needed. 3. When the tomatoes are nearly ready, add the drained linguine into the pan and combine with the sauce so it is well coated. Carefully tip the clams into the pan, cover for a couple of minutes and steam until the shells open. Discard any that do not open. Finish with the basil and serve in warmed bowls immediately. Nduja and cherry tomato vongole- a summery version of an Italian classic that is perfect for dining al fresco! As I’m writing this I’m sitting with the heating cranked up and considering reaching for a blanket to try and warm up so such a light pasta recipe may sound a little strange for a winter’s day. It’s simple really, I love seafood and sometimes these cravings have to be indulged regardless of the season! Crab pasta recipes usually use white meat however I have chosen to use half white and half brown meat as this really ramps up the flavour. The addition of baby plum tomatoes are also lovely if you like. 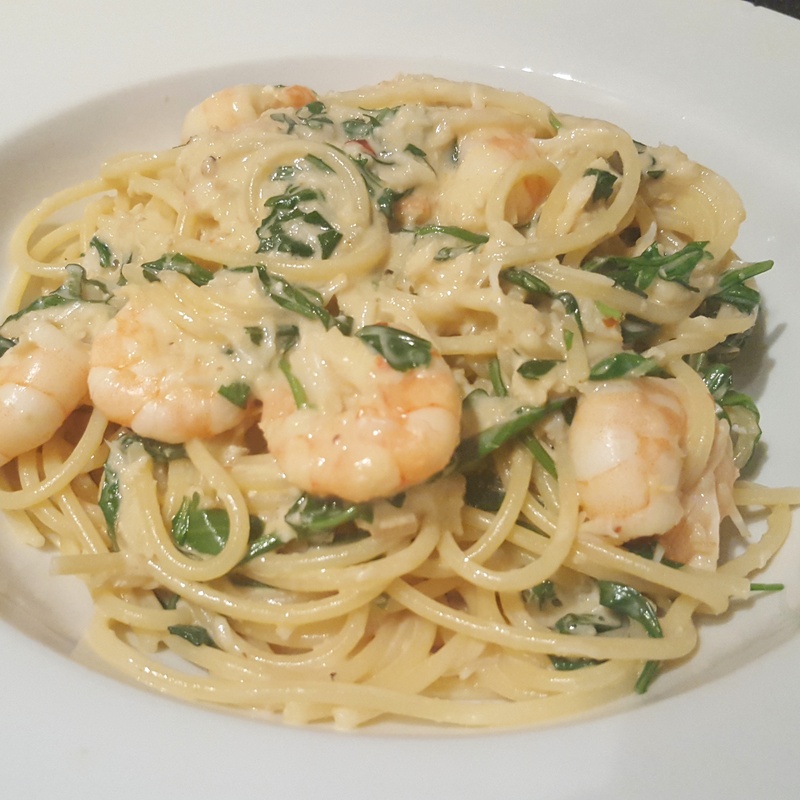 The sweetness of the crab and prawn pair perfectly with the gentle heat from the chilli and kick of acidity from the lemon so read on and get twirling that spaghetti! 1. Start by bringing a large pan of water to the boil; cook the spaghetti according to packet instructions and drain when it is perfectly al dente. Drain well. 2. Whilst the spaghetti cooks, get going on the sauce as it won’t take long. 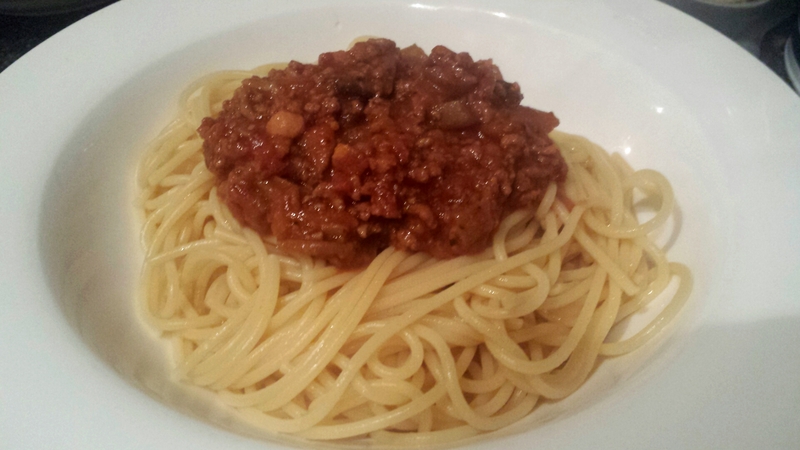 I can’t stand pasta that is drained and then stands around for ages, slowly clumping into a wonderful mess so avoid! Take a large frying pan and add a glug of oil over a medium heat. Add the garlic and red chilli and cook for a couple of minutes until softening. Add the white wine and reduce the amount by half before lowering the heat. In goes the crème fraiche and simmer for a minute or two. 3. Pop the deveined raw prawns into the pan and cook for a further minute before adding the crab meat and rocket. Simmer until the prawns are a gorgeous blush pink and the sauce is warmed through. Season to taste. If the sauce looks a little dry then add a splash of the water from the pasta pan in to loosen it slightly. I try not to add extra crème fraiche as this tends to make it even thicker and a bit claggy. When the pasta is ready, add it to the pan with sauce and toss to coat each strand of spaghetti well and finish with a good squeeze of fresh lemon juice to really make the flavours sing. Serve immediately. N’duja is an utter joy to behold so if you haven’t tried it before read on. Think spicy, think flavoursome, think n’duja. It’s an Italian soft, spreadable sausage style meat that is so versatile and has become more available over the last couple of years so look out for it in your local Italian delicatessan. 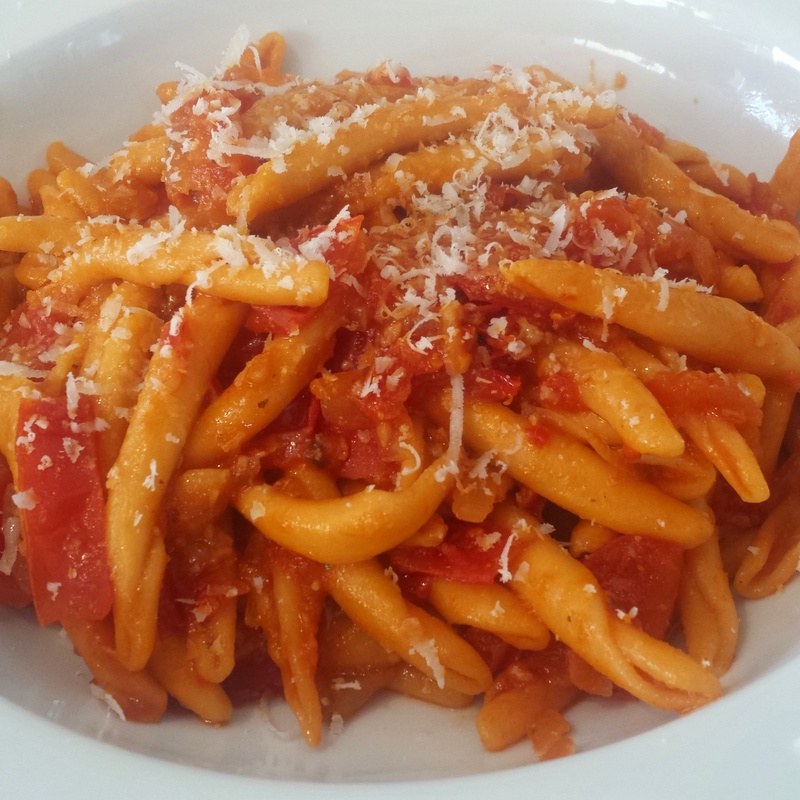 I love it in simple pastas so give it a go! I use one from www.eatdrinkideas.co.uk who you can also find on a Saturday at the St Albans farmer’s market. 1. Heat the oil over a medium heat in a saucepan and pop in the banana shallot and garlic to cook for a couple of minutes until starting to soften. I love using banana shallot (which is not actually a shallot, but a cross between a shallot and an onion) to add a gentle sweetness but you can add a small onion if you prefer. 2. Take the equivalent of 2 tbsps of n’duja and stir into the pan. The heat will break the meat down and it will melt into the shallot and garlic. Remember that n’djua can be quite spicy so you can always add a bit more as you go but you can’t take it back out again! You can try a bit before you add it if you’re not sure how hot your n’duja is. 3. The tomatoes need their seeds removed before cutting into small chunks. I leave the skin on for an extra texture however you can take these off if you prefer. Add these to the pan along with the parsley and season to taste. 4. Simmer the sauce for around 45-60 minutes until thickened. Have a quick taste and you can add a little more n’duja at this stage if you want a bit more kick! Just before the sauce is ready, prepare the fusilli, drain well and stir through the sauce to coat each piece. I sprinkle a bit of extra parsley to serve along with parmesan. N’duja- once you have discovered it you will wonder how you went all these years without it!